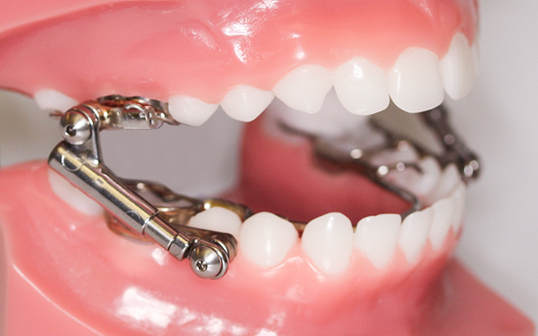 Functional appliances are utilized in growing patients to aid in the correction of jaw growth discrepancies. 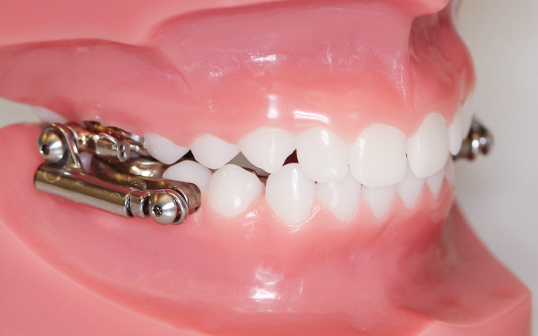 This appliance is comprised of custom fabricated surgical-grade stainless steel frameworks cemented to the first permanent molars in all four corners of the patient’s mouth. These frameworks are connected by telescoping mechanisms that aid in modifying the Class II malocclusion by exerting an upward/backward force on the upper jaw and a forward force on the lower jaw. These types of appliances work comfortably with a patient’s inherent growth to affect the desired changes. Since the Herbst Appliance is cemented to the permanent first molars, it is working at all times. At the patient’s appointments, the appliance may be advanced using stainless steel “shims” to affect greater correction. The appliance may also be activated in the width dimension if an expansion mechanism is incorporated into the appliance. Typically, the appliance is worn for approximately 12 months with severe cases requiring additional time. We encourage patients to clean the appliance with toothpaste and a toothbrush. A fluoride mouth rinse may also be helpful to make sure that all exposed surfaces of the teeth are protected during appliance wear. Upon initial placement, the patient can expect to feel the appliance on the tongue and cheeks but speech obstruction and soft tissue sensitivity tend to disappear in the first week or two of wear. With pronounced jaw discrepancies, continued treatment with other appliances will be essential to the ultimate success of treatment. The patient and the orthodontist are partners in this adventure and helpful participation by the patient can make the process proceed as planned. Careful oral hygiene and compliance with all the prescribed appliances can help make the process a raging success!